THE MOTHER OF ALL STAR WARS POSTERS. If you're looking for the ULTIMATE Star Wars movie poster, look no further - YOU JUST FOUND IT! This is a RARE one: The famous 24-sheet Movie Theater Billboard rendered by legendary poster artist Tom Jung. 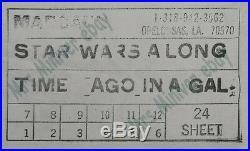 This amazing artifact of cultural significance was made in 1977 to advertise the upcoming film Star Wars, produced by 20th Century-Fox - The rest of the story we all know. Star Wars became a force of world changing history that still impacts everyone on the planet today. This is the beginning of that movement. This 24-sheet billboard poster size was only issued when the film first came out. Almost all the billboards were pasted up and used, so only a FEW survived. There are less than ten of these known WORLDWIDE! That's RARE by any standard! Many consider it the HOLY GRAIL of ALL Film Posters. It's definitely THE MOTHER of ALL Star Wars posters. This poster, as was the case with all 24-sheet posters manufactured at the time, was printed in 12 separate paper sections. When assembled, in total it measures 19 feet 7 inches by 8 feet 9 inches. That's a pretty precise exact accurate measurement. How do I know this? Right at about 25 years ago I obtained another one, which, in 1999, I had professionally linen-mounted in one solid piece. I carefully measured it then, before it was cut down from the stretcher. I went to great lengths to have it professionally photographed back then, and so I'm able to provide this great photo now - you can really see how stellar of an item this original truly is. That's how it was issued back in 1977, folded. Photo #2 is of those folded sections unmounted in Excellent++ unbacked condition. Photo #3 is a stamp on the back of the poster to show the paper hanger how it goes together. This original can easily be mounted in one section, but I'll leave that decision up to the new owner. As a service, I can provide the winner with all the necessary information on where and how this can be done for them, if they so choose to have it mounted. Many collectors like to keep these type of items in their original state. Either way, it's a winner beyond compare. If you're looking for investment/museum quality item. Make it the cornerstone, or better yet - BACKDROP - to your collection. Ben Obi-Wan Kenobi Anthony Daniels.... It can crash regardless of any decision you make and can even crash regardless of any decision made by the company related to the stock - Leaving you with a near worthless piece of paper that won't inspire anyone! The magnificence of art and historic documents have an inherent value that relates to civilization and society. Please write with any questions. 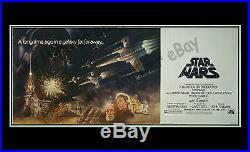 If you're in the market for top quality original vintage movie posters or Star Wars, then please. The item "THE MOTHER OF ALL STAR WARS MOVIE POSTER ORIGINALS! RARE BILLBOARD" is in sale since Thursday, April 4, 2019. This item is in the category "Entertainment Memorabilia\Movie Memorabilia\Posters\Originals-United States\1970-79".miniver" and is located in Studio City, California. This item can be shipped worldwide.